‘Tis the season for apples. If you’ve never gone, get yourself to an orchard to pick some fresh apples from the trees. Be sure to save some time for sipping apple cider, nibbling on apple cider doughnuts, and even some pumpkin picking! 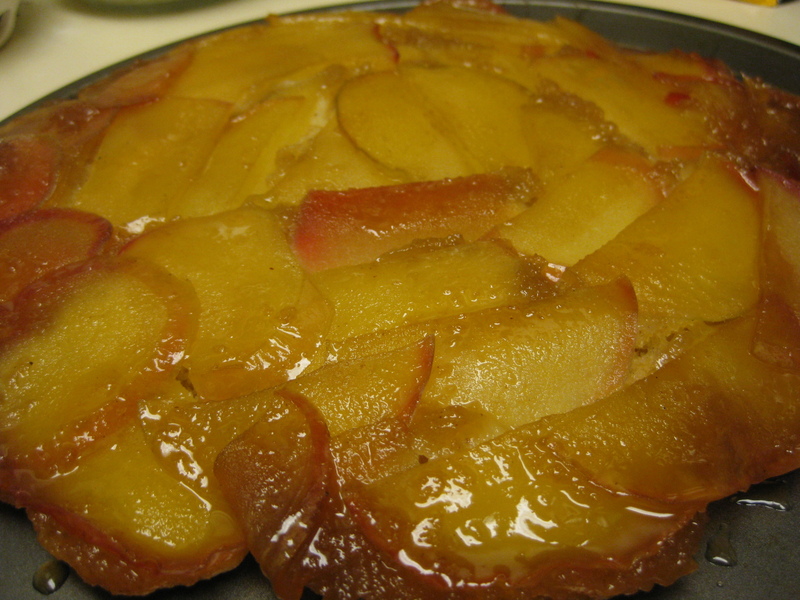 This is a simple upside-down skillet cake. What I love best about it is the low sweetness. I use tart apples and the biscuit-like dough is more savory that sugary sweet, which means it’s good for breakfast too (shhhhh….don’t tell!). I adapted this from a Gourmet recipe (Sept. 2000). Over medium heat, melt the margarine in an ovenproof 10-inch heavy cast iron skillet. When the foam subsides, stir in the brown sugar and remove from heat. Spread mixture evenly over the bottom of the skillet. Arrange the apples in 1 layer with the slices overlapping. In a food processor, pulse together the flour, sugar, baking powder, baking soda, salt, cinnamon and nutmeg. Add butter and pulse until it’s blended through and the mixture looks like coarse meal. If you don’t have a food processor, you can use your fingers to blend or cut the butter in with two knives. Pour the flour mixture into a large bowl. Add the buttermilk and stir it in just until the flour mixture is moistened through. 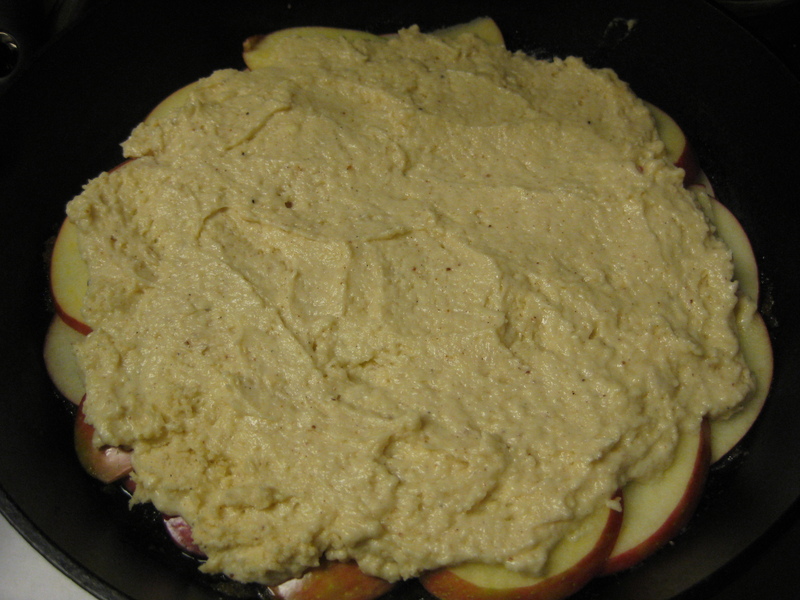 Drop the batter by spoonfuls on top of the apples. Spread gently, leaving an inch-wide border around the edge of the skillet. The biscuit will expand while baking. Bake until golden brown and firm, about 30 minutes. Remove from oven and allow the cake to cool in the skillet on a rack about 3-5 minutes. Invert the cake onto a serving plate. 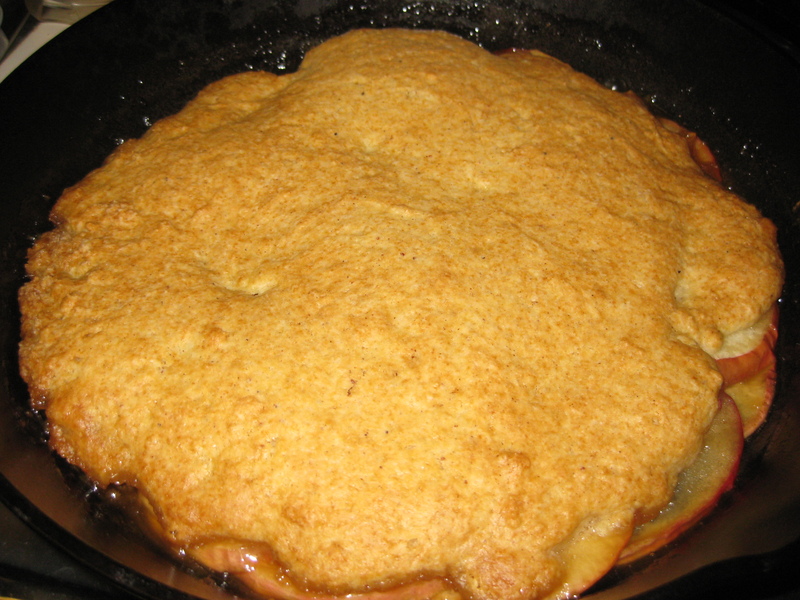 Replace any apples that stuck to the skillet. * If you do not have buttermilk, you can easily make a substitute: add 1 T lemon juice to a measuring cup. Pour in enough milk to reach the 1 cup line. Allow to sit for 5 minutes, undisturbed. Stir and use as your buttermilk. I ran across a variation of this recipe the other day and couldn’t stop thinking about it. Maybe that’s because I’m a big fan of potatoes and am always looking for interesting way to prepare them, but it might just be because it combines them with mustard and lemon and sounded wonderful! These are great when they are fresh, but they also reheat well for a snack or with a fried egg or as a dinner side. The original comes from the December 2007 Gourmet. Place the cut potatoes in a bowl of water to remove some of the starches. Preheat your oven to 425 and spray two baking sheets with non-stick spray. In a large bowl, mix together the mustard, olive oil, butter, lemon juice, garlic, oregano, and basil. Season with salt and pepper to taste. Drain the potato wedges. Stir them into the mustard sauce, making sure they are evenly coated. Spread wedges on the prepared baking sheets in a single layer. Roast for 20 minutes. 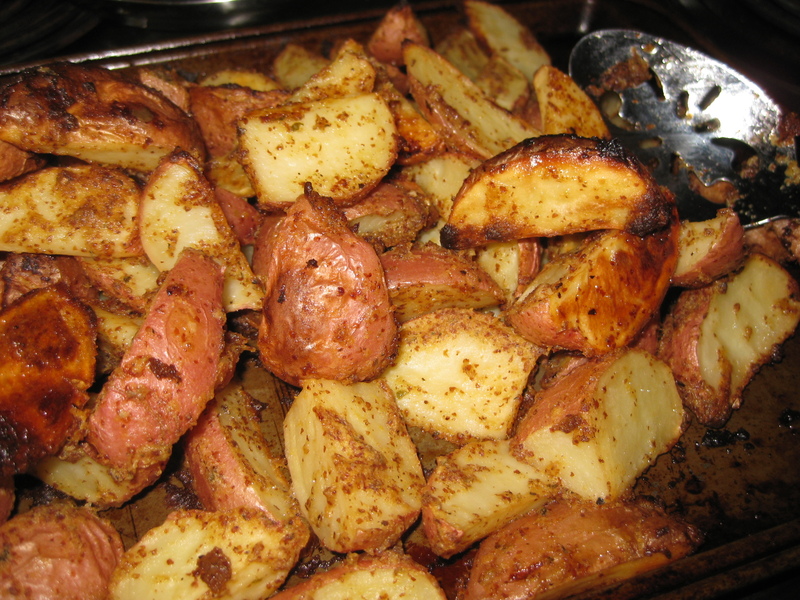 Stir the potatoes and swap the trays if baking on different levels to ensure even roasting. Continue roasting for another 25-35 minutes, or until the outsides are golden and crispy and the insides tender, stirring occasionally. When I visit my parents, I try to sneak in at least one or two great seafood meals. Particularly during the summer, this means finding something delicious to do with lobster. I convinced my parents to give this seaside gumbo a shot. It pairs well with the herb polenta we had the night before. Heat olive oil and butter in a large non-stick skillet with high sides over medium-high heat. 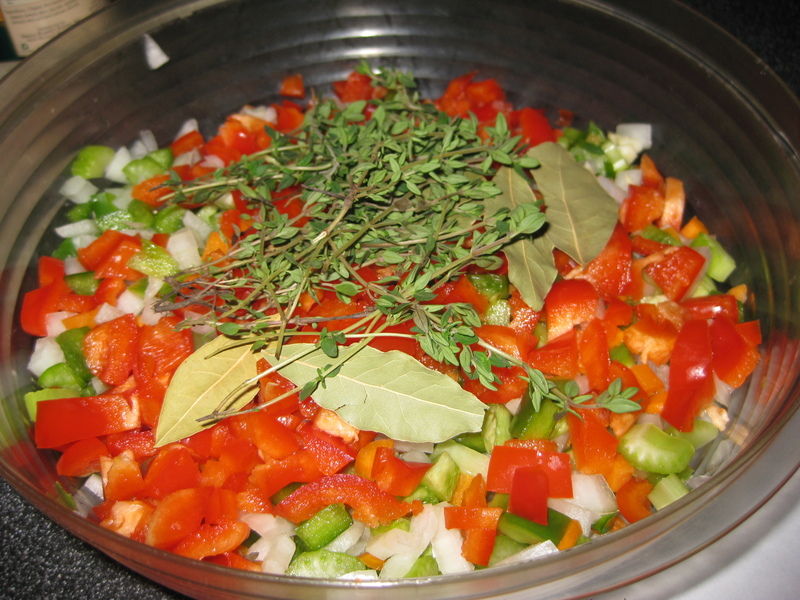 Add garlic, onion, celery, green and red peppers, thyme, and bay leaves. Saute about 8 minutes until just turning tender. Mix in the flour and hot sauce. Cook for an additional 2 minutes. Stir in the beer and allow to cook off halfway. 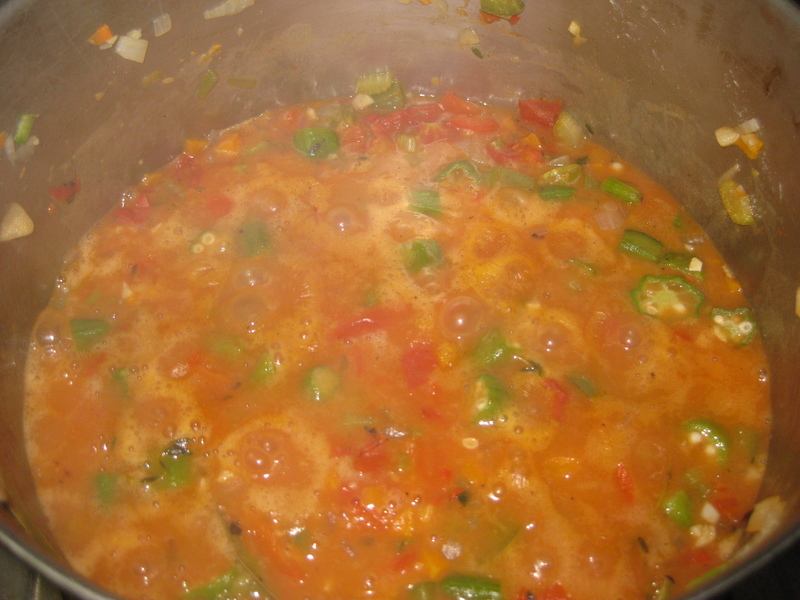 Stir in the stock, tomatoes and okra, and bring to a light boil. Mix in the scallops and shrimp and cook another 5 minutes or so. You want the shrimp to be pink and firm and the scallops to be cooked through. Remove from the heat and mix in the cooked lobster meat. Season with salt and pepper to taste. Remove the bay leaves and thyme stems. 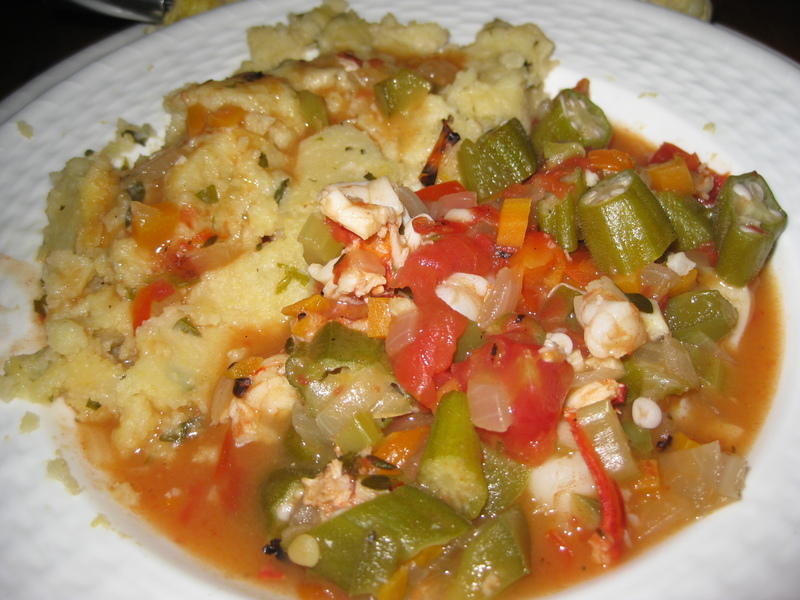 Serve with polenta and cold beer! Last time I was home, my mom requested cheesecake. 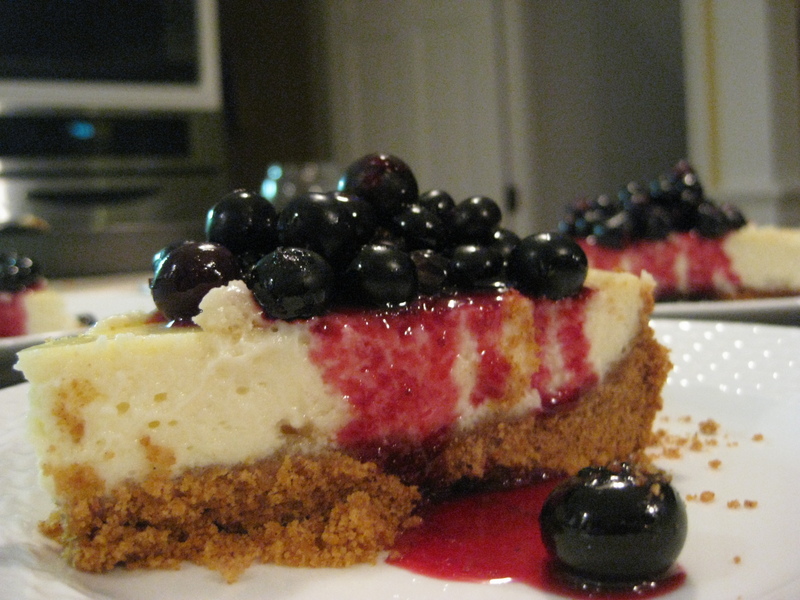 This is an adaption of an “ultimate cheesecake” from the Food Network. It’s deliciously lemony and great on a summer evening. Combine the graham crackers crumbs, cinnamon, nutmeg and melted butter with a fork until moistened. Spray the bottom and sides of an 8-in springform with non-stick cooking spray. Press the crumbs into the pan, covering the bottom and slightly up the sides. Refrigerate while you mix the mix the filling. With an electric mixer, beat the cream cheese on low speed just until smooth and lump-free. Add in the eggs, 1 at a time, and beat slowly until just combined. Gradually beat in the sugar until creamy. Mix in the sour cream, lemon zest, vanilla and almond. Scrape down the sides periodically to ensure it is well mixed. Pour the filling into the crust and smooth with a spatula. Bake for 45 minutes; it should still jiggle in the middle, because it will firm further while chilling. Allow to cool for a half hour in the pan. Chill in the refrigerator for another 4 hours, loosely covered. Loosen from sides and unmold. Meanwhile, combine the fresh blueberries with the lemon zest, lemon juice, sugar and preserves. Simmer over medium heat about 5 minutes until the berries begin to soften. Cool slightly before topping the cheesecake. This goes well with the bistecca too (or with gumbo…just wait for it!). 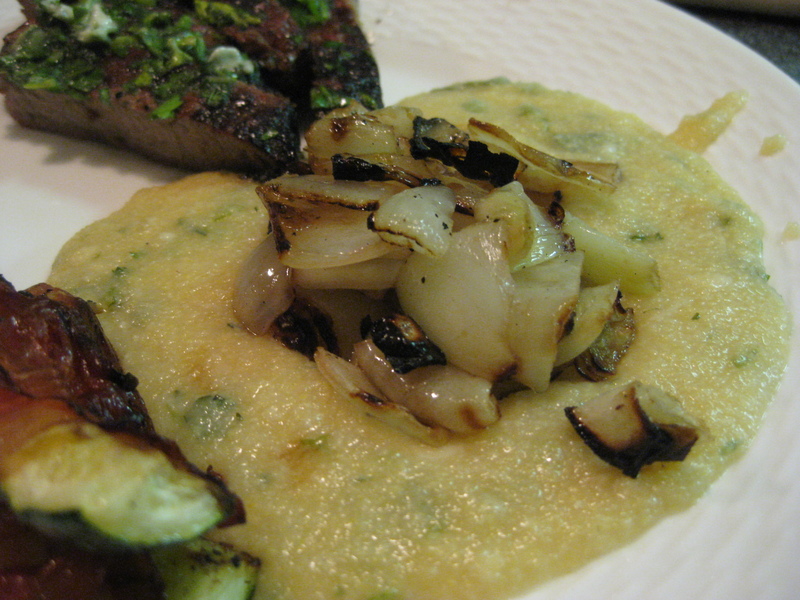 Polenta is a boiled ground corn dish popular in Italy; it’s very similar to grits. On a grill or grill pan, cook the onion skewers until tender and browned (about 10-15 minutes). Remove from grill and toss with the balsamic vinegar. Meanwhile bring the broth and water up to a boil. Whisk in the polenta until smooth. When it reaches the right consistency (about 3-5 minutes), remove from heat. Stir in the herbs and cheese. Season with salt and pepper to taste. Serve topped with the balsamic grilled onions. 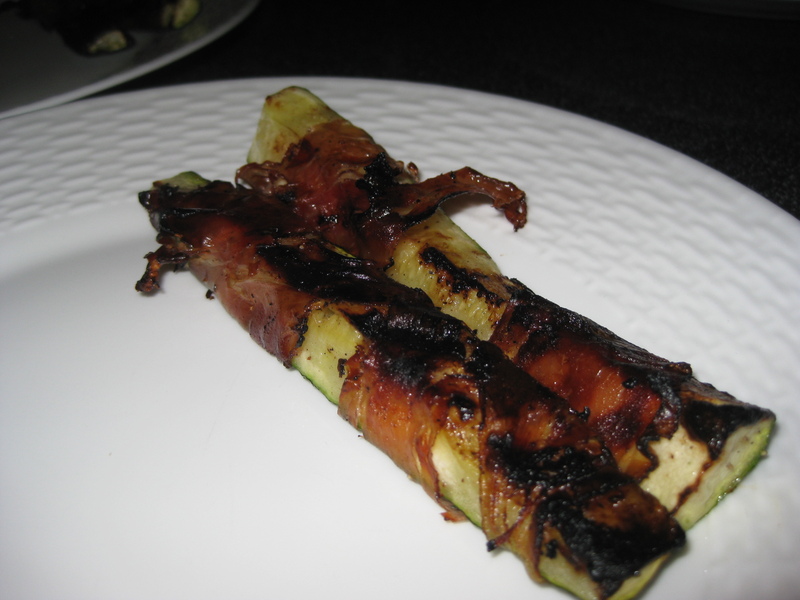 This side dish is a fantastic mix of fresh summer zucchini and crispy prosciutto. It is a perfect side dish for the bistecca, and it can easily be tossed onto the cooler side of the grill. Toss the zucchini with the olive oil and pepper liberally. 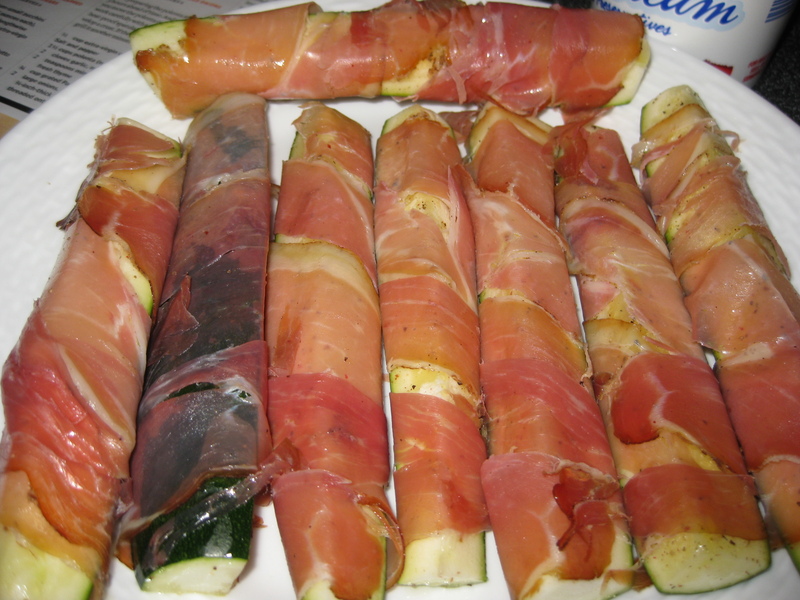 Wrap each spear with prosciutto. Grill spears until tender with crispy prosciutto, roughly 7 minutes. The end of summer makes me a little sad. When we had really nice weather over Labor Day weekend, I couldn’t resist a grilled dinner extravaganza. 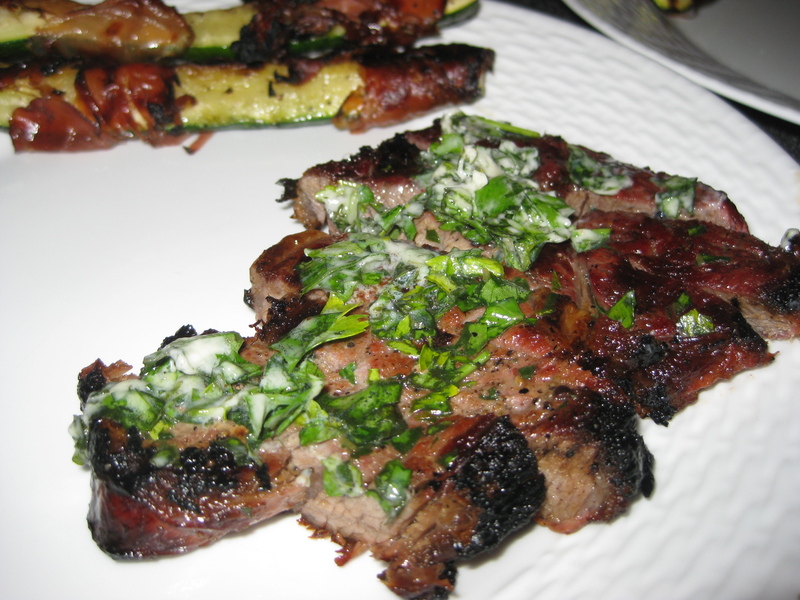 This grilled rib eye is a simple variation on Tuscan steak, full of flavor from fresh herbs and lemon. Dry the steaks off. Rub both sides of each steak with half of a garlic clove, and sprinkle with salt and pepper to taste. Refrigerate 1 hour for flavors to meld. 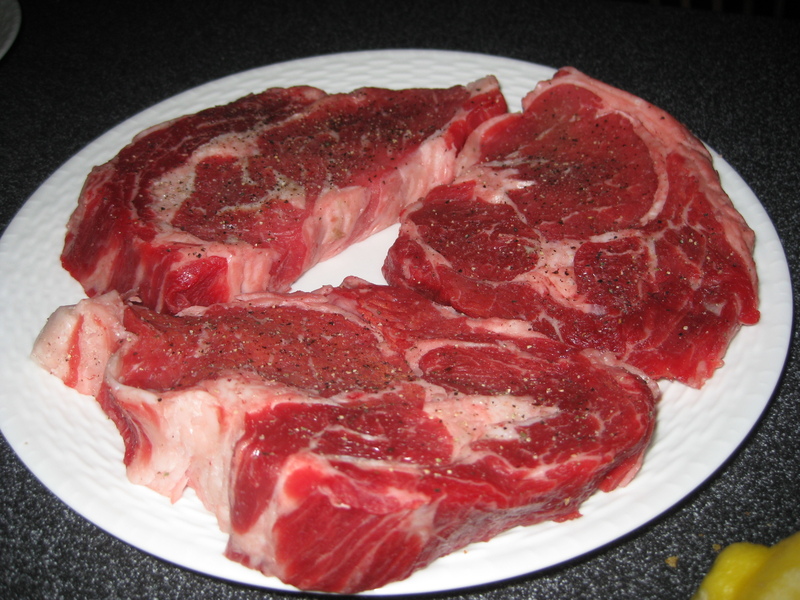 Remove the steaks from the refrigerator and allow to rest at room temperature for 20-30 minutes. Prepare a medium-hot grill. 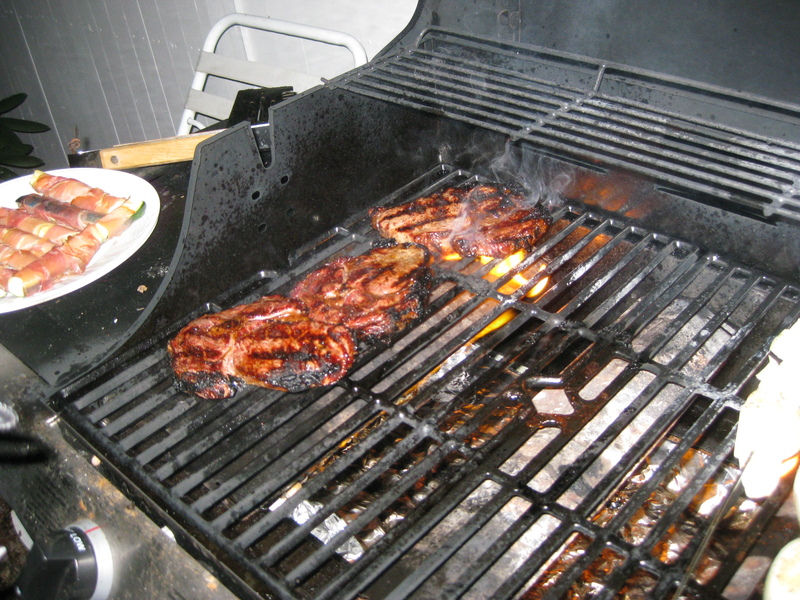 If using charcoal, split the grill and have one hotter side and one low heat side. Start the steaks on the hot side and grill until seared, roughly 5 minutes. Flip the steaks and sear on the other side another 5 minutes. Continue cooking on the cooler side of the grill if you like your steaks closer to medium. (120 degrees will be rare, 125 is medium-rare, and 130 is medium). Remove from heat and allow to sit for 10 minutes before cutting. Steaks will continue to cook slightly. Meanwhile, in a small bowl, combine the softened butter with the minced herbs. Slice the steak on the bias into 1/2-inch thick slices. Squeeze fresh lemon juice over the steaks and top with the herb butter. You are currently browsing the Muffin Bites blog archives for September, 2010.